It's not new, and it's not special: disability is part of America. It's All About The Plan! One of the issues I first faced when I started working for Disability Rights Nebraska was “why” the need for an agency whose focus was on “disability.” I have often heard asserted, usually by those who object to the work I do, that focus on the interests of individuals with disabilities implied some form of “special” status. My own status as a student of history (my undergraduate degree was in History) convinces me that this perception of “special” status is based upon a lack of understanding of our actual heritage. This nation is rapidly approaching its 250th year of existence, and in that time we have grown from a handful of states joined together in a bid for survival on the edge of a vast wilderness into a transcontinental powerhouse. By contrast to this lengthy history, many of the statutory provisions around which my work for the agency revolve have existed for much less than my own short 60 year presence on this planet. Even the linguistics around what we do sometimes portrays our work as different from other Americans, such as the use of the term “special education.” A review, however, demonstrates that a focus on disability is not just a discussion of rights; rather, it is a preservation of American heritage. When looking at our nation’s history, it is the end result that most often captures our attention. It is the “city on the hill” which becomes most visible, not the ashes of the cities that were engulfed in flame (Chicago, Atlanta, San Francisco) on the way there. Likewise, we tend to see individuals who built this nation as “whole and unencumbered” instead of “burdened by issues.” Merriweather Lewis is simply remembered as a man who opened the west, not as a man who faced significant mental health issues. To miss the impact of disability in the growth of this nation, and to treat it as a mere anomaly, misses part of its grandeur. America’s history includes a litany of individuals who overcame physical and mental hardship to grow. We have endured multiple wars, including a great civil war, in our national evolution. These wars seared scars upon our national physique, yet the very people who endured those traumas brought us to great heights. Indeed, any nation born of a revolution must have its roots in disability, as many participants in revolution complete their lives with some form of disability incurred in the course of that revolution. 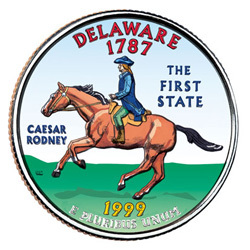 It is accurate to say that our very nationhood was furthered by the actions of an individual with a disability, Caesar Rodney, whose “ride” was portrayed on the “first state” Delaware quarter. Rodney undertook his grueling ride at a time when he was dealing with cancer; that ride was essential to his being able to cast Delaware’s vote for the Declaration of Independence. Michael "Mike" Elsken is a Staff Attorney at Disability Rights Nebraska. He describes himself: "I am a man rapidly approaching my 6th decade, whose first love was the American Civil War. I came to Disability Rights Nebraska after 19 years of private legal practice in Lincoln. When I have an interest, I embrace it with my entire being."